Nestled on the coast, Margarets Beach Resort is located at the foot of the Leeuwin Naturalist Ridge at the beautiful Gnarabup Beach. Our resort offers a range of self-contained accommodation options from stylish Studio's through to large Two Bedroom Two Spa Townhouses, sleeping up to 6 people. Long Weekends and special events as deemed special by the property. Available in the October school holidays at a $50 per voucher surharge. 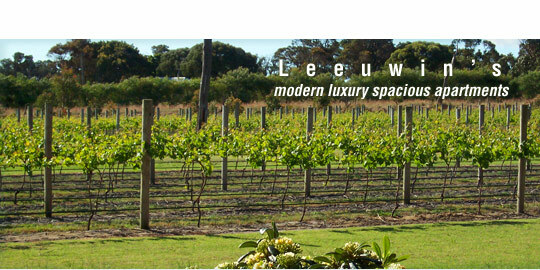 FORTÉ LEEUWIN APARTMENTS ARE THE SOUTH-WEST'S BRAND NEW FULLY SELF CONTAINED APARTMENT ACCOMMODATION. SITUATED IN THE WORLD FAMOUS WINE REGION OF MARGARET RIVER, LEEUWIN APARTMENTS ARE ONLY A FIVE MINUTE STROLL TO THE LOCAL TOWNSHIP, WHICH BOASTS RENOWNED RESTAURANTS, BARS AND EXTENSIVE GALLERIES. WE ARE ALSO PERFECTLY LOCATED FOR YOU TO INVESTIGATE THE VAST VARIETY OF WINERIES THIS REGION HAS TO OFFER. OUR FANTASTIC AND EXTENSIVE ON-SITE FACILITIES INCLUDE; AN LARGE OUTDOOR SWIMMING POOL, 2 OUTDOOR HEATED JACUZZI'S, FULLY EQUIPPED GYMNASIUM, SAUNA, HALF SIZE TENNIS COURT AND A BBQ. EACH APARTMENT FEATURES UP TO 3 BEDROOMS AND INCLUDES FULLY EQUIPPED KITCHENS WITH DISHWASHER AND MICROWAVE OVEN, SATELLITE TELEVISION, DVD AND CD PLAYERS, WASHING MACHINE. THESE SUPERBLY APPOINTED APARTMENTS ARE PERFECT FOR THE ROMANTIC COUPLE, THE CORPORATE TRAVELLER, HOLIDAYING FAMILY OR SMALL GROUPS. AN APARTMENT WITH DISABLED FACILITIES IS ALSO AVAILABLE. Welcome to The River Hotel of Margaret River, Western Australia. THE RIVER HOTEL & MARGARET RIVER RESORT - STAY! We're very excited to offer a different range of rooms in our beautiful pocket of the world. Our Pub Rooms are located upstairs, above our bar and restaurant and feature a Queen size bed, ensuite and tea & coffee facilities. Our Motel Units are situated at the rear of the property - a short 1 minute stroll from the reception - and have 1 x queen bed and a single bed with standard room facilities. Our Spa Suites, surprisingly enough, do feature a spa in each room and a queen bed - some with a functioning kitchenette! The Villas also have a full kitchen and laundry facilities. Sign up to our mailing to be kept up to date of all our upcoming events. We'll keep you in the know. $89 will secure this great deal. Call Oceanroad holidays to secure your discounted voucher. Quote voucher number when booking. Voucher must be surrendered to reception on arrival. Excludes most school holidays, public holidays, long weekends and special events as deemed special by the property. Available July school holidays at no surcharge. To book your stay call 08 9757 0000 quoting your Oceanroad Voucher number.